Seven U.S. players earned their first caps in Sunday night's 3-0 win over Panama. 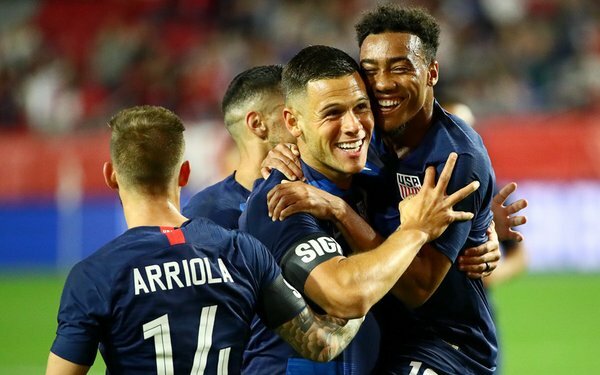 None is older or traveled farther to make the national team than 27-year-old forward Christian Ramirez, who came off the bench to score the third goal. "It has been a long journey to get here," he said afterwards. "It's been a different path." -- Ramirez was born in Santa Ana, California, to Colombian immigrants but spent part of his youth in Colombia before returning to Southern California, where he grew up in Garden Grove. -- He played two years at UC Santa Barbara but it wasn't until his move to Concordia-Irvine, then an NAIA school, that he came into his own, scoring 18 goals in 2011 and 26 in 2012. -- He wasn't drafted out of college so he began his pro career with the third division Charlotte Eagles in USL PRO before graduating to Minnesota United, then in the NASL. -- In 2018, he was shipped in mid-season to LAFC in a controversial move that disappointed Minnesota fans and was only made worse when his replacement, Colombian Angelo Rodriguez, scored only one goal in his first six starts after signing as a Designated Player. Ramirez scored twice in his first start for LAFC and didn't score after that in the regular season, but he did enough in Minnesota -- 21 goals in 50 games -- to catch Gregg Berhalter's attention and get a call-up as one of three forwards along with Gyasi Zardes and Jeremy Ebobisse. It wasn't Ramirez's first call-up. He was called up by Dave Sarachan a year ago to the January camp, but didn't get to play in front of his family when the USA played Bosnia-Herzegovina at the StubHub Center in Carson. He didn't even dress for the game that ended 0-0. "I used it as fuel all year," he said on Sunday night. "It was a learning experience. I felt like I really wasn't myself. I brought myself into this camp and really showed who I am to the staff and I am just happy to contribute." Ramirez's goal was a tap-in following a run into the area by Jonathan Lewis, the other debutant coming off the bench. "We talked about it at halftime," he said. "If we got isolated, I'd be inside the two posts, and if he can slide a ball in to me, I'll be there. Credit to him -- an incredible play. I did the easy part and tapped it in." Ramirez said the game was a special moment -- made even more special because his family made the trip from California for the game. "I am thankful for my teammates and coaching staff for believing in me to bring me to this camp," he said, "and it is an honor to represent this country. And to have my family, wife and baby here means a lot." 5 comments about "First cap: Christian Ramirez's special moment". beautiful game, January 29, 2019 at 10:01 a.m.
Again , what does Zardes bring to the table...low Soccer IQ and not much more. humble 1 replied, January 29, 2019 at 11:06 a.m.
Hat's off to Christian Ramirez! Well deserved and a great story for kids grinding it out. He lead the entire Minnesata United team to sign my boy's MU jersey in a hotel lobby when they visited our town. As for Zardes, listen to any interview with him and you may appreciate him more. He has a winning attitude and a strong work ethic. Attitude is half of what needed fixin' on USA Men's. He also knows GB's system from Columbus. This was clear in the game. Craig Cummings, January 29, 2019 at 9:22 p.m.
Christian Ramirez the pride of La Quinta HS in Westminster CA< Where Dean Wurzberger got his coaching start. Dean was my coach and mentor. Where in 1982 and 1983 we won 2 CIF titles because of Deans coaching lessons. Saddly he had just left and did not coach LQ in our CIF titles. He went on to bigger and better teams. Tom G, January 30, 2019 at 10:51 p.m. Wonderful story and inspiring . Neil Cohen, January 31, 2019 at 2:21 p.m. Played with Sam Bick and Jim Pollihan on the National Team and they were very strong players.